Last night while watching E! 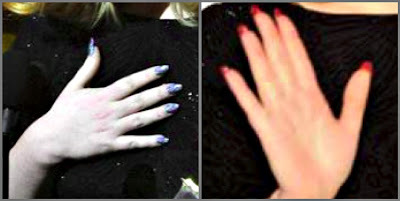 Online's Red Carpet presentation, my eyes were immediately drawn to Adele's nails. Of course, I thought she looked absolutely stunning, but I was left wondering what that contrasting look was on her tips. I just received the press release on her manicure, and it was produced using Ciaté Paint Pots. Below are images and information about her look, and I have to admit that I'm extremely excited about the very last line of this press release! Adele made her debut comeback at last night’s Grammy’s looking as glamorous as ever. 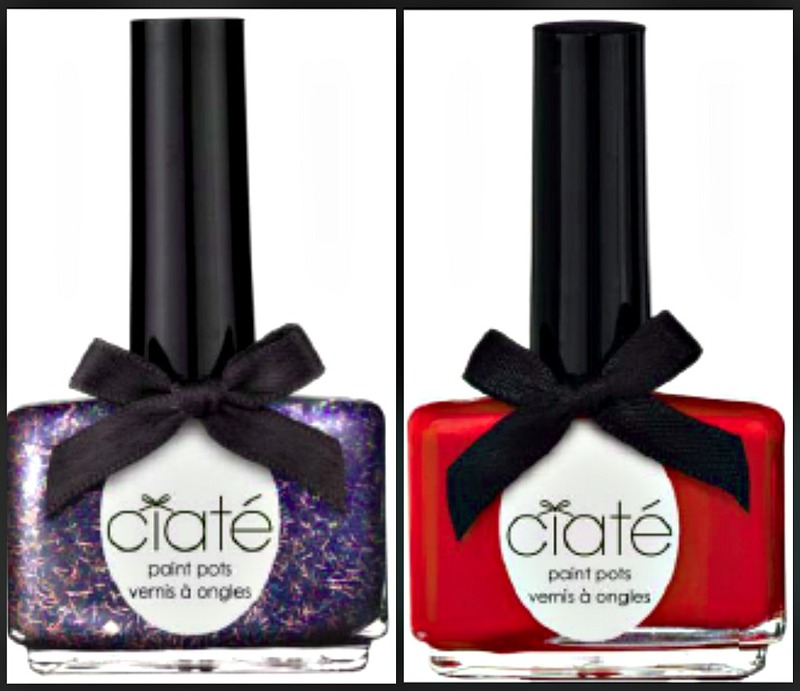 Her nails were expertly polished by celebrity manicurist Mike Pocock in a ‘Louboutin’ style using Ciaté Paint Pot in Jewel on top and Ciaté Paint Pot in Mistress underneath. 250 bristle, flat brush to give an even, smooth finish to the nails in three easy strokes. Very cool! I was mesmerized by her nails last night as well! Can't wait til these are available at Sephora! Her nails caught my eye right away too and I kept looking at them as the camera would barely touch on them. She did look beautiful - agree with you. Her hair was perfect for her - love that color she has it. Earrings were amazing for her face and her look of the night. But those nails! Thanks for tracking this down...and wow - coming to Sephora. I knew it was something more complex than just a blue glitter. Red with a blue-silver/pink(fuchsia) bar glitter - never would have called the red under the blue! And on makeup from last night's Grammys - I adored the fuchsia lip color on Katy Perry! I am back on my pursuit now for the perfect fuchsia I can wear as well as a now red I can wear. I spent the winter in tinted lip balms. Looking now maybe at Tarte lipsurgances for a red. Been really happy with Tarte in lots of things and the lipsurgences I don't get pealing lips from - which I think is from (in my case) some of the paraffins maybe. I thought it was a foily charcoal but it was so hard to tell, now we know, how colorful and fun. I said to the person I was watching with that her nails would be all over the blogs today, lol! It looked great! Thank you for sharing this! 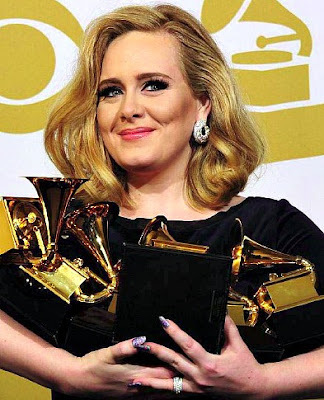 I was really wondering what was on Adele's nails. I'm even happier to know that this brand will be coming to Sephora soon! I LOVE her mani. Pretty! Now we know how to replicate it! After I noticed Adelle's makeup I noticed her nails. I was also wondering what she had on. Thanks for finding out.